The International Maritime Organization’s (IMO’s) new SOLAS container weight requirements are in effect as of Friday, July 1, 2016. The IMO is implementing worldwide changes to the Safety of Life at Sea (SOLAS) convention, which has roots that can be traced to the aftermath of the RMS Titanic disaster in 1914. In May 2014, the IMO approved amendments to the convention that will affect importers and exporters everywhere. 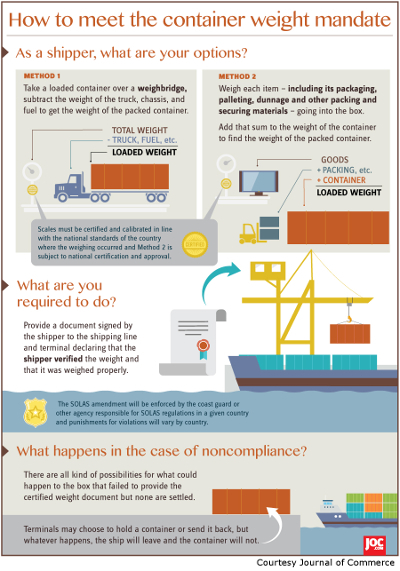 The changes to SOLAS will require exporters to present and verify the weight of containers along with a person’s name before they are received at the load port/terminal and placed aboard ships. UPDATE – The IMO has relaxed its stance on the enforcement of new Safety of Life at Sea (SOLAS) regulations, instructing regulators to take “a practical and pragmatic approach” when enforcing the new regulations for a period of three months immediately following July 1st. The practical impact of this policy change is a 3-month grace period for enforcement of the verified gross mass (VGM) Requirement. It’s important to note that the effective date of the new safety regulation took effect on July 1st, it is only enforcement of the VGM requirement that is delayed. Initially, the new SOLAS regulation required shippers (and forwarders when they are named as the shipper on the bill of lading) to verify and provide their container’s VGM to the ocean carrier and port terminal prior to it being loaded onto a ship. The new VGM regulation generated confusion among the trade and many forwarders, shipping lines and exporters were unprepared for the new rules, prompting fears of ocean supply chain disruption and port congestion. The recently announced 3-month grace period for enforcement was applauded by the trade. It will give additional time to obtain further clarification from the IMO and U.S. Coast Guard, which will enforce the new VGM requirements most likely on or about October 1st. Method 1, upon the conclusion of packing and sealing a container, the shipper may weigh, or have arranged that a third party weigh, the packed container. Method 2, the shipper or, by arrangement of the shipper, a third party may weigh all packages and cargo items, including the mass of pallets, dunnage and other packing and securing material to be packed in the container, and add the tare mass of the container to the sum of the single masses of the container’s contents. The new requirement was approved by the IMO’s Dangerous Goods, Solid Cargo and Containers (DSC) Sub-committee and adopted by IMO’s Maritime Safety Committee (MSC) at its 94th session in November. AAEI is providing some documents to help shippers understand the changes and how they will impact international trade. *On June 29, 2016, the Port Authority of New York and New Jersey released a Carrier VGM Matrix with the latest available information on how and when the VGM can be transmitted to various ocean carriers. *On May 19, 2016, the Ocean Carrier Equipment Management Association (OCEMA) announced it is working with 6 major ports to develop a common streamlined Terminal Weighing Approach to providing verified gross mass (VGM) at port locations. OCEMA says the method will provide shippers, carriers, and terminals with a simple means of compliance with the SOLAS VGM requirements. *On March 21, 2016, the Ocean Carrier Equipment Management Association (OCEMA) unanimously adopted a Recommended Best Practice for the Acceptance and Transmission of Verified Gross Mass. This is the first comprehensive “roadmap” adopted by any industry group. It represents five months of work by an OCEMA VGM working group, during which time OCEMA also conferred with industry stakeholders on various technical aspects of the Best Practice. *On February 18, 2016, the USCG announced its position that the United States will honor the July 1, 2016 deadline and begin enforcing the VGM documentation requirement of the SOLAS amendment. Rear Adm. Paul Thomas (USCG) said a delay would “send the wrong message” to other countries that the U.S. is not a safe place to load cargo. The USCG says enforcement will not carry any penalties for non-compliance, but containers will not be loaded onto ships without the VGM documentation.